It’s been almost two years since millennial pink, aka Tumblr pink, aka that muted rosy shade found on Glossier products and the inside of Mansur Gavriel bags, rose to ubiquity. At times, it seemed as though another self-acknowledging “gendered” hue might usurp millennial pink’s throne, that baby blue or lavender might begin its own stereotype-redefining reign. But thus far, none have managed to build up the hype that, to this day, surrounds that oh-so-trendy faint flamingo pink. We’re about 95 percent certain that’s about to change. 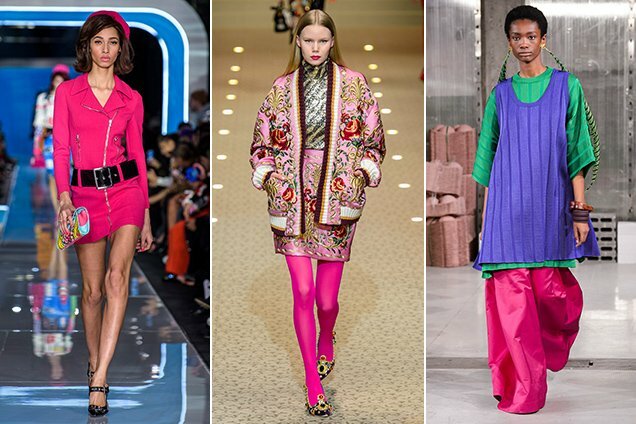 As exemplified by the Fall 2018 runways, subtlety is OUT and all things 80s — including hot pink, the MTV Generation’s favorite color — are IN. Some might call it fuchsia. Others Schiaparelli pink, after the surrealist, Paris-based Italian designer credited with beginning the “shocking” pink rage back in the 30s. To sneakerheads, it’s “Laser Pink,” the bright, Barbie-esque color that’s splashed all over Nike and Comme Des Garçons latest Air Max 180 collab. Whatever you label it, the loudmouth hue was all over the Fall 2018 runways — particularly those of New York and Milan. In New York, Michael Kors, Alexander Wang, Anna Sui, Adam Selman, Cushnie et Ochs, Oscar de la Renta, Hellessy, Matthew Adams Dolan, Ulla Johnson, Marc Jacobs, Carolina Herrera, Prabal Gurung and more proved that hot-pink knows no aesthetic limitations. 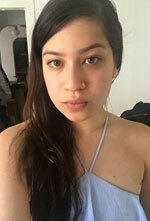 It’s perfect for NSFW officewear (i.e. the tailored, body-con, zip-up onesies that came paired with Matrix shades at Wang), seductive off-the-shoulder evening dresses (teamed with bold statement tights at Selman) or relaxed, whimsical knitwear and trousers (as seen at Johnson’s 20th anniversary show). 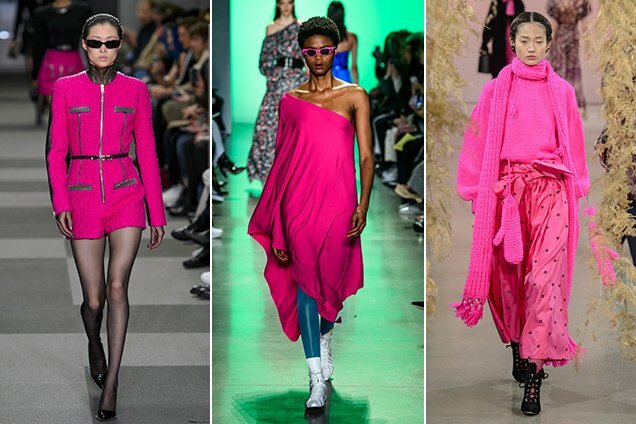 Suffice it to say, with Alessandro Michele’s more-is-more styling philosophy flooding all corners of the fashion world, hot pink can pretty much be considered a neutral. And the fact that the color was so prevalent on the Fall 2018 runways serves as a clear indication that the fashion world is ready to dress like Fran Drescher. So we picked out 20 items that’ll add a pop of hot pink to your wardrobe, all shoppable in the slideshow below.